Located almost centrally in the Philippines archipelago, the island province of Bohol is about 1 hour and 45 minutes directly south of Manila and about 30 minutes southeast of Mactan Island, Cebu. Bohol is one of the 4 provinces of Region 7, which has the islands of Cebu at its northwest, and Leyte in the northeast. 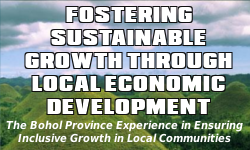 Access to Bohol can be by air or sea transportation direct from Manila and some Mindanao provinces or via Cebu. There are also small sea crafts plying the Bohol-Leyte route. 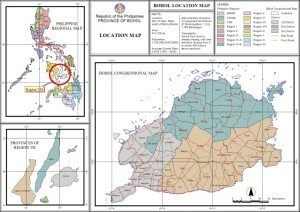 Bohol is within north latitude 9050’00” and east longitude124011’. Bohol is about 556.16 nautical miles directly south of Manila and 39.7 nautical miles southeast of Mactan Island, Cebu.